Minimum stay in this home is 5 nights. There's a charm about this one bedroom, ground floor pied a terre. Rose Street is a famous Edinburgh Street which sits in between George Street and Princes Street. It has more bars per yard than any other street in the capital giving Rose Street the nickname "The Amber Mile". ?Rose Street is fully pedestrianised and there's a great selection of small restaurants and boutiques. This apartment is in the section of Rose Street which leads onto Charlotte Square. It's possible to walk anywhere in central Edinburgh from here, but it's also close to bus and tram routes. You'll be spoiled for choice for things to do withing a five minute walk of this home. This home is well designed, decorated and furnished. You enter into a well-equipped galley kitchen.? The spacious sitting room, with contemporary furniture and a large L shaped sofa, is ideal for relaxing after a busy day. There's a TV with Freeview and a door which leads to the private parking space. The double bedroom had a built in wardrobe with lots of storage and the and the shower room is really spacious. This home has a parking space and the cost for the parking is ?50/week. This cost is NOT included in the rental figure our website calculates - it is an additional cost. If you are booking for between 4 and 10 weeks, the parking will cost ?40/week and ?37.50/week if you are staying for 10 weeks or longer. Please mention if you would like to book parking at the time you make your booking. The owners of this home prefers shorts lets of a month or longer. Very short bookings of less then a week can be booked up to 6 weeks in advance or further in advance where they are filling a gap between existing bookings. We do have other one bedroom homes where bookings of less then a week are always possible. Please contact us and we'll let you know which are the most suitable. 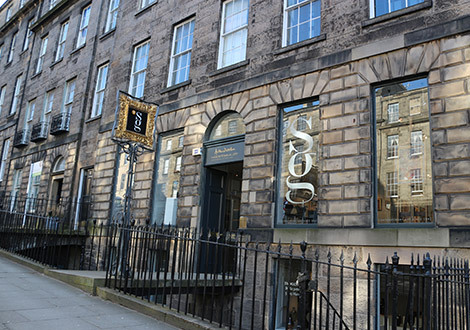 Rose Street South Lane is the perfect pied a terre and the perfect home whether you're in Edinburgh on holiday or for a few months. The parking space will fit a smaller car and will require a confident driver to access it. This home has a parking space and the cost for the parking is £50/week. This cost is NOT included in the rental figure our website calculates - it is an additional cost. If you are booking for between 4 and 10 weeks, the parking will cost £40/week and £37.50/week if you are staying for 10 weeks or longer. Please mention if you would like to book parking at the time you make your booking.